The Naung Pha dam is one of many dams planned on the Salween River. 90% of the produced electricity will be exported to China, while the associated social and environmental burdens have to be carried by local Shan communities. The cascade of large dams proposed on the free-flowing Salween River is a longstanding concern among residents, civil society organizations and academics [1,2,3,4,5]. 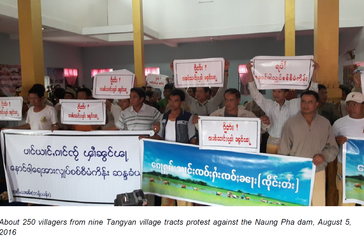 The proposed 1,200 MW Naung Pha dam, located in Northern Shan State between Lashio and Ho Pang township, is one of these dams that has caused opposition and resistance by local groups and larger civil society networks. Civil society organizations (CSO) have raised concerns over the manifold environmental, social and political impacts and implications the dam would cause . As part of the series of planned dams that would irreversibly change the Salween river, the Naung Pha hydropower project poses severe threats to biological and cultural diversity , as well as to the livelihoods of local residents. CSOs denounce the way how the Environmental and Social Impact Assessment (ESIA) was conducted by the Australian company SMEC (see project details). They criticize that the ESIA was conducted largely “in secrecy” and that no large public consultations were held. People were informed just a few hours before the consultations. Promotional campaigns stating that consultations were “successful” and that people asked the company to start construction as soon as possible, misrepresented the situation, they say [1,6]. Moreover, the dam is located in an active conflict area where local armed groups have not signed the 2015 Nationwide Ceasefire Agreement and where significant tensions and open conflict between the Burmese army and the ethnic armed group remain. The construction of the Naung Pha dam would lead to a reinforcement of Burmese troops in the area to secure the dam site and thus increase the likelihood for further armed conflict . Groups criticize that political pressure to construct the dam, exerted by both the Myanmar and Chinese government, is undermining a fragile peace process [1,6]. While the Union government claims that dams are needed to address Myanmar’s growing energy needs, reports state that 90% of the electricity produced by the dam would be exported to China [1,7]. Beyond the social and political concerns, the project causes also fears of dam breakage and disasters among Shan communities, because it is located within a zone prone to earthquakes. The dam is close to the Nampawng fault line and its reservoir also overlaps with the Nam Ting fault line, where several earthquakes took place during the last years . People have started to mobilize against the hydropower project. 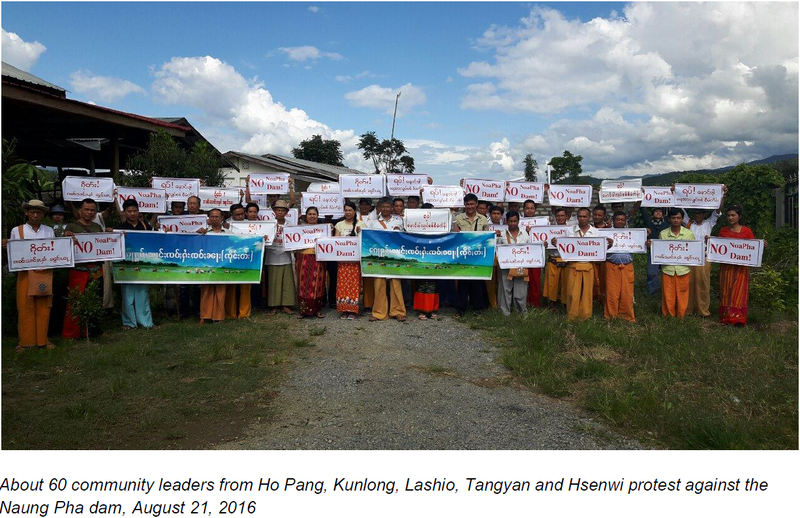 On August 2016, about 250 people from nine villages gathered to protested against the dam plans. During the subsequent months, several other protests followed, involving hundreds of northern, southern and eastern Shan State farmers [1,8]. Press releases were prepared and press conferences held to denounce the dam plans. Open letters were sent to government officials. On August 17, 2016 a letter was sent to State Counselor Daw Aung San Suu Kyi, signed by 26 civil society groups that demanded a halt of the project [6,7,8,9]. 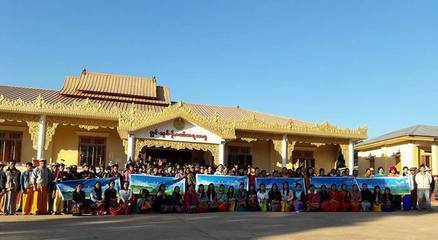 On December 23, 2017 a large meeting and a ceremony were held at Wat Ho Mang temple (Tang Yan township), with 300 village representatives from seventeen townships. The participants called for a halt of the Naung Pha dam as well as the stop of all hydropower projects located on the Salween river: “The government should listen to the voice of the people, and help stop the Naung Pha and other dams on the Salween river, which have no benefit for local people, Shan State or the union, but just benefit foreign investors […] Local people will just lose their land, face natural disasters and have to relocate.” (leading organizer, quoted in ). Project Details The planned Naung Pha dam is located on the Salween River in Northern Shan State, between Lashio and Ho Pang townships . The Memorandum of Understanding (MoU) between Myanmar and China was signed in December 2009 . The main companies reported to be involved are the Chinese state-owned Hydrochina Corporation, and the Burmese International Group of Entrepreneurs. Australian company Snowy Mountains Engineering Corporation (SMEC) is responsible for the Environmental and Social Impact Assessment (ESIA) [see 1]. The International Finance Corporation (IFC) is involved in a countrywide strategic environmental assessment (SEA) for hydropower development on the Salween river, which includes the Naung Pha dam. Civil society groups also denounced the IFC’s involvement in organizing stakeholder meetings that ignored the group’s opposition to the dam . Tai Literature and Culture Association (Karli). Why? Explain briefly. Decisions to go ahead were made, ignoring the opposition of many civil society organisations opposing the dam. The Irrawaddy, online news, 23 August 2016. "Environmental Advocates: Salween River is Being ‘Sold Off’ to China". (accessed online 22.03.2018). 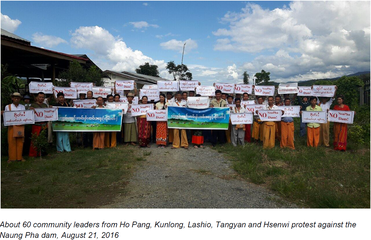 Action for Shan State Rivers, Report from 23 August 2016. "Concerns about the Naung Pha dam on the Salween River" (accessed online 22.03.2018). STATEMENT BY THE COMMITTEE FOR SHAN STATE UNITY (CSSU) ON PLANS TO BUILD DAMS ON THE SALWEEN RIVER. 29 August 2016. (accessed online 22.03.2018). Salween Watch, 14 March 2014. "Hydropower Projects on the Salween River: An Update". (accessed online 22.03.2018). Salween Water Governance: Matching Policies, Institutions and Practices of Water Governance in the Salwee-Thanlwin-Nu River Basin - Towards inclusive, informed, and accountable water governance. Chulalongkorn University. The Irrawaddy, online news, 17 January 2018. "Locals Upset Over IFC Meeting Regarding Salween Hydropower Project". (accessed online 22.03.2018). Media release by Shan State Farmers’ Network (Tang Yan), December 24, 2017. 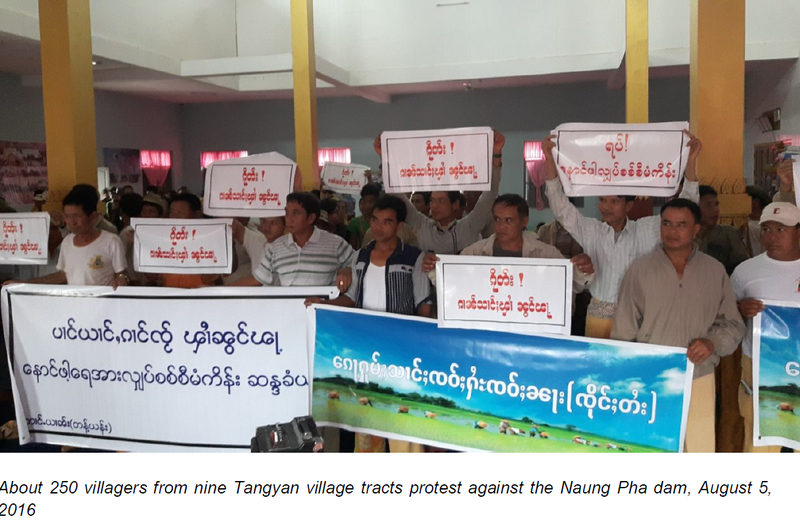 "Northern, southern and eastern Shan State Farmers oppose the planned Naung Pha and other hydropower projects on Salween River". (accessed online 22.03.2018). International Rivers 2012. "The Salween River Basin: Dam Cascades Threaten Biological and Cultural Diversity". (accessed online 22.03.2018). Eleven Myanmar online news, 24 August 2016. "26 Shan groups call for halt to Salween dams"(accessed online 22.03.2018). The Nation online news, 24 August 2016. "Shan community groups want Salween dams scrapped". (accessed online 22.03.2018).